Click Here For $50 Off Coupon!! The amount your family spends on a marker or monument is based on your budget. Factors that affect the price include the intricacy of the design, the material type and size. We can provide you with a price estimate based on your design ideas, budget and cemetery specifications. 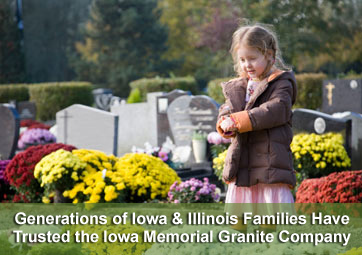 Iowa Memorial Granite Company, founded in 1943, designs and produces granite headstones, gravestones, grave markers, monuments and memorials for Iowa and Illinois families to be used in cemeteries and memorial parks. We also design and manufacture community, veteran, military, war and civic monuments for municipalities, towns and cities, We design and build granite signs for businesses and residential communities. We offer a wide selection of bronze memorial and recognition plaques. If you have a question about ordering a monument or memorial, click on one of the 3 links below to get a question answered, request an estimate or request that a brochure be mailed to you. At Iowa Memorial Granite, we can design and provide you with headstones, bronze markers, granite memorial benches, gravestones, and any type of cemetery monuments. Remembering those you love is what we do; and we do it better than anyone else. Please stop by and see us at our location in Muscatine and let us assist you with this very special purchase. 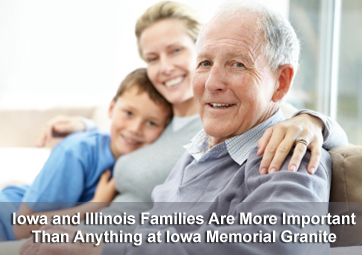 At Iowa Memorial Granite, your complete satisfaction is our top priority. It is this commitment to excellence that has kept us in business for over 65 years. We offer the finest, most beautiful granites from around the world and carve each one in our own production facility. Each piece is carefully inspected upon arrival to ensure it meets our strict quality standards. 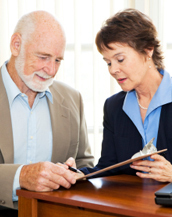 Our expert memorial counselors will work with you to create a special tribute for your loved one, at a price you can afford. Each memorial we craft comes with our written perpetual guarantee, so you can rest assured the memorial you select will be there for generations to come. We serve the residents of the Quad Cities metropolitan area ( Davenport, Bettendorf and Scott County in Iowa; and Moline, East Moline, Rock Island and Rock Island County in Illinois and Cedar, Clinton, Jackson, Louisa and Muscatine counties in Iowa; and Carroll, Henry, Mercer and Whiteside counties in Illinois. Click here to review our price guide so that you can understand rates, fees and costs associated with Iowa and Illinois cemetery monuments, memorials, headstones, gravestones, tombstones and grave markers. People interested in looking at monument and grave marker pictures can visit our design gallery. This web site display many pictures of gravestones and headstones designs available and people interested in buying a monument or purchasing a grave marker can request pricing and estimates through the web site. 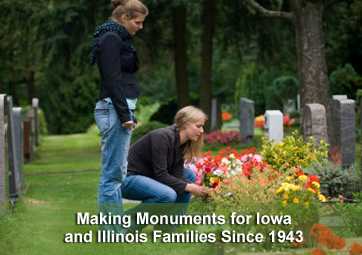 Click here for information on ordering a marker or monument for an Iowa or Illinois cemetery. The company provides a complete selection of upright monuments, single grave monuments, 2 grave monuments, family monuments, etched gravestones with hand engraved scenes, granite memorial benches, raised headstones, slant face grave markers, bevel top grave markers, flat granite markers, flush or lawn level gravesite markers, cemetery markers for infants and children, single markers, companion markers, bronze markers, bronze plaques, cremation urns, cremation memorials, veterans' memorials, community and civic monuments, granite signs, bronze memorial and donor recognition plaques, private estate and family mausoleums. Contact the Iowa Memorial Granite Company at 563-263-5484 to get information on pricing and ordering. Our web site includes many good examples of epitaphs, inscriptions, quotes and sayings that are etched into cemetery monuments. We provide on-site engraving services in which one of our skilled craftsman will add a name and/or date to a gravestone that has already been placed above a grave in a cemetery. Read the story titled "54 years later, phone call unites rescuer, women" written by Bill Wundram of the Quad-City Times Published on July 11, 2014. Read "A slice of life" written by Mike Ferguson published by the Muscatine Journal on August 08, 2013. Learn About the Services We Offer Such as the Delivery, Installation, Maintenance, Cleaning and Repair of Monuments,Grave Markers, Headstones and Gravestones. Visit our Facebook page, Google+ page or watch our YouTube video. Get information about headstone, gravestone, monument, memorial and grave marker prices and ordering. We pride ourselves on our craftsmanship and want you to be 100% satisfied with the your family's memorial.